Sebastian Coe (right) has warned Russia it still has work to do if it is to be allowed to return to international competition in time for next year’s World Athletics Championships in London. 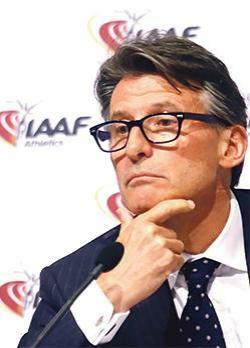 Lord Coe, president of the International Association of Athletics Federations (IAAF), says he is eager to lift the suspension on Russian athletes which was imposed in November after an independent World Anti-Doping Agency report revealed widespread state-sponsored doping. But he insists any re-integration must be on the IAAF’s terms, with the Russians having already missed at least one opportunity to have their suspension lifted. In June, an independent task force set up by the IAAF reported that Russia had not met certain conditions, which effectively resulted in its ban from the athletics competition at the Rio Olympics. Coe said: “I’ve made it very clear that we need to get Russia back into the international frame, but only when we’re absolutely sure and confident that they are competing in systems that are clear and clean. “It has to be our ambition not to leave a country sitting outside the athletics family, but it has to be when change is really demonstrable and we are confident that the reintroduction of Russian athletes will be into a landscape that is clean and with integrity. Although Russian athletes were banned from competing in Rio, the IAAF said it would make exceptions for those who could prove they had trained and been tested outside the Russian system.